When we bought our second hand stove/oven, the gimball was pretty high, and used the weight of the unit itself to balance. 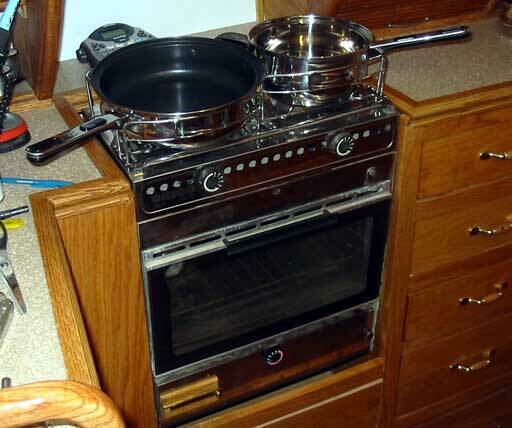 It had a sheet metal type of surround to stop pots from sliding off. I saw this as limited because too big a pot, or a frying pan wouldn't fit in the little "box". The small grate had to be modified to hold larger pots so they didn't slip off and land on the floor! This would be a delicate welding job at best, and would need to look fairly good, so I grabbed some 1/8" SS rod out of the arsenal, and started in on making the pot holder cage. The photo shows the two different types. 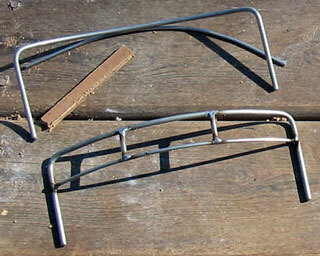 The one with the extra bar is to hold different height pots, and the simple bent one is a back which will sit lower. Isn't this technical?! It took a lot of trying different pots and heights and this is what I came up with. Below, the photo gives a good idea of how I did it. The cage would also need to be adjustable for different sized pots. 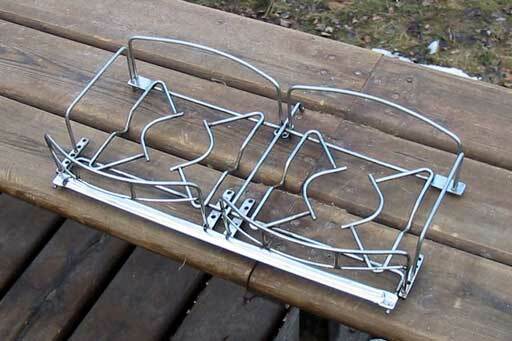 This means little bars with several holes drilled in them so the cages can be moved back and forth. 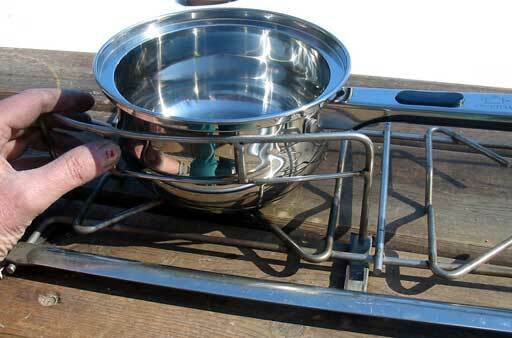 "Pot Testing" for stove cage. This photo (right) is of my day's work. The little tabs welded on easily once I got the heat setting right. 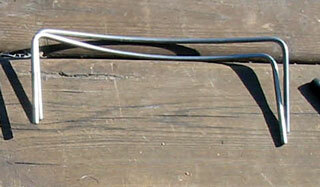 A TIG would be better for doing this, but patience and time works just as well! Little tabs were added outward at the back. The bends are a little larger than the hole positions so they snap in. This way they won't rattle back and forth while under way. The SS was cleaned off with 3M pads as polishing this stuff proved to be tricky, and dangerous! If you compare this photo with the top of page photo, you can see I added some little curved bits in the center of each burner. I did that because our smallest 2 pots just fell sideways through the hole! You'd think the manufacturer would have thought of this. It is, after all, their business! The last photo (right) is of the whole assembly in action. These pots are curved in some as they go up, so actually snap into place. Sweet! 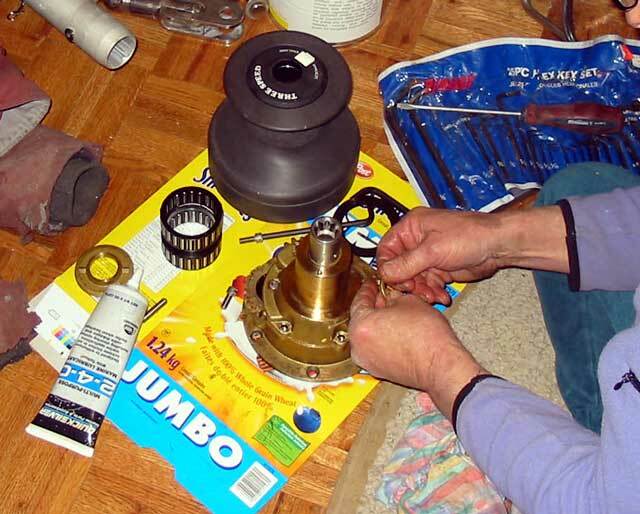 Gena spent her day starting to clean the 4 used Lewmar 55 winches we acquired on eBay, at a good deal - even though the guy never sent us the last one. It was then she discovered the 4th was missing parts! Luckily she found a place that carried them. Fisheries Supply, in Seattle ( I think) had them. Pawl springs and a collar were gone, but not expensive. That 2.4.0 grease is a special marine grease. That was available not 10 minutes from here at the marine shop in Calmar. Most of the time we must shop the world for stuff like that. Go figure! She eventually was happy everything worked out, even though she couldn't finish those winches. 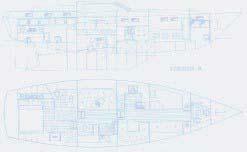 Shown in the photo is one of the little black Lewmar 44's we will be using for the main sheet.